Parachuting, also known as skydiving, was invented by André-Jacques Garnerin in 1797. Garnerin jumped from a hydrogen balloon 980 meters above Paris. His parachute was not packed into a backpack and did not have a ripcord. Today’s parachuting technology was largely developed by the military as a way of deploying soldiers into battle zones and saving aircrews from emergencies onboard. 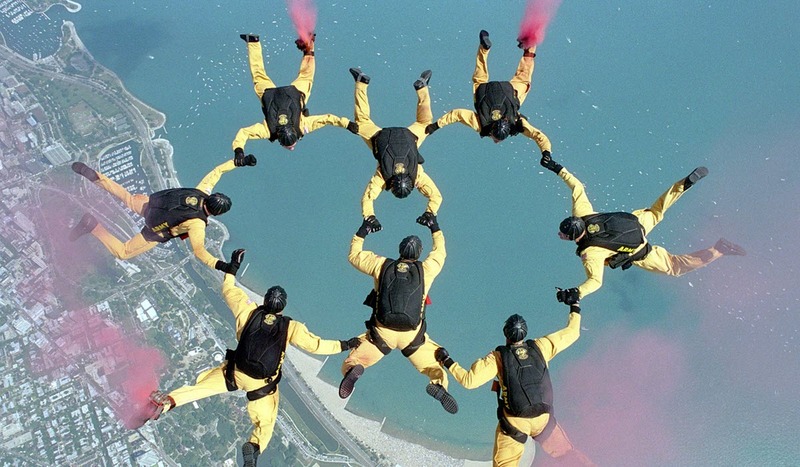 A majority of hobby parachuters do not participate in parachuting contests; they simply enjoy the skydiving experience without any need for competitive elements. For those interested in competing, contests are arranged at local, regional, national and international levels. The main international umbrella organization for national parachuting organizations is Fédération aéronautique internationale (English: The World Air Sports Federation), a governing body for air sports. This federation, which was founded in 1905, is headquartered in Lausanne, Switzerland. The skydiver wears a wingsuit which adds surface area to the body, increasing the inlift. Parachuting or wingsuit flying from a fixed structure (not an aircraft). Base jumping is more risky than traditional skydiving, since the altitude of the jump is lower and the risk of hitting or getting entangled in nearby structures is higher. This is a parachute contest where participants can show off their accuracy when it comes to landing in a specific spot. The aim is to land as close as possible to a rocking chair, remove the parachute harness, run to the chair, sit fully in the chair and commence rocking. A contestant will be timed from the moment their feet hit the ground to the moment of the first complete back and forth rock. Canopy Relative Work (CReW) is a skydive where two or more participants aim to fly in close proximity to each other and create various formations by “docking” with each other in the air. Each jumper will open their parachute very soon after exiting the aircraft. It is standard practice for CReW jumpers to carry a hook knife sharp enough to quickly cut one or more parachute lines in case of entanglement in the air. The aim is to land as far away from the jump location as possible. In favorable conditions, this can be several miles. A cross-country skydiver will normally open their parachute very soon after exiting the aircraft. The skydiver wears a board attached to the feet and performs surfing-style aerobatics in the air. A typical sky surfing board will look similar to a snowboard. When a skysurfer is filmed by another skydiver falling alongside the surfer, the resulting video clip will make it look as if the skysurfer is riding on the air just like a surfer rides on an ocean wave. Since both the skysurfer and the camera operator are falling down, the downward motion will not be very noticeable on camera. The jumper aims to touch down and glide across a small body of water and onto the shore.